Historical objects and sites are a testimony to every country’s civilization and cultural heritage. They serve to Bridge the gap between past and present and instill in the people a sense of belonging and pride and the importance of cherishing their invaluable legacy. In April 1987, the government officially opened Thailand’s first historical park, the Muang Sing Historical Park in Kanchanaburi. Today, 10 historical parks have been opened – tree of which have received the honor of being designated World Heritage Sites. The 10 historical parks are Muang Singh, Phanom Rung, Sukhothai, Si Satchanalai, Kamphaeng Phet, Sri Thep, Phimai, Ayutthaya, Phra Nakhon Khiri and Phu Phra Bat. They are the result of hard work of the Fine Arts Department in the excavation, renovation and landscaping for several decades. Each of these parks in now equipped with a tourist and information centre and provides qualified guides. This is one of the most important sites in the Khwai Noi River basin in Kanchanaburi. Prehistoric human skeletons have been discovered near the ancient city, together with metal tools, vessels and ornaments, bricks, foundations of Dvaravati period architecture and laterite ruins from the 13th century. The remains of the ancient city comprise several layers of rectangular walls and a moat. The annual festival within the historical park is the “Thin Buri Sri Chai Sing” featuring a light and sound show and classical dances. The Northeast includes many historical monuments in the Khmer style from prehistoric times to the 13th century. Among these, Prasat Hin Khao Phanom Rung is one of the most important. This is the only Khmer religious monument constructed on a natural mountain. Restorations have made a great contribution to the study of Khmer architecture in Thailand. A special festival is Phanom Rung Fair, held either March or April each year. A satellite town of the Sukhothai era, Si Satchanalai is located on the bank of Yom River, 50 kilometers from modern Sukhothai. Ruins of 134 monuments have been discovered in the park. The city plan was laid out along fixed cosmological lines – temple complexes lay at its heart, surrounded by city walls, rivers and forest. It is considered by many historians to be the apogee of Thai city planning. On account of its relation to the Kingdom of Sukhothai it was selected to be on the World Heritage List in 1990. The annual Songkran Festival is held in April within the historical park itself and throughout the province. Khamphaeng Phet was an important city of the Sukhothai Kingdom from the 13th to 15th centuries. 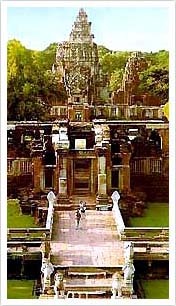 The earliest mention of the city appears in the stone inscriptions from Wat Mahathat and Wat Phra Sri in Khamphaeng Phet. The Ayutthaya annuals mention that this city was known as “Muang Chakangrau” and was ruled by a prince from Sukhothai. Cultural and folk festivities are held in April each year to celebrate the Nop Phra Len Pleng Festival. The large ancient city of Sri Thep in the Pasak River basin served as a centre of communications between the cities in central Thailand and those in the North and Northeast for a long period. Archaeological excavations conducted in the Pasak and Lop Buri river basins have revealed that highly-developed prehistoric cultures flourished with more advanced technology than that of any other sites in neighbouring areas. From the 14th to 18th centuries, Ayutthaya was the capital of the central Thai Kingdom for 417 years. With influences from Dvaravati, Khmer, Mon, and Lawa cultures, Ayutthaya was able to create its own arts and culture from a delicate blend of those cultures. During the reigns of 33 kings, Ayutthaya gave Thailand a great number of fine buildings, monuments and works of art. It was selected as a World Heritage Site in 1994. An annual festival, Ayutthaya World Heritage Day, is held in December within the historical park. The largest stone monument in the Northeast is Prasat Hin Phimai in Phimai Historical Park. It was erected for the practice of Mahayana Buddhism in the early 12th century. This particular monument became the prototype of Angkor Wat in Cambodia, Which makes it of even greater historical and aesthetic importance. An annual Phimai Festival within the historical park is held in November. Festivities include a special light and sound show and classical dances. The park is situated on the Phu Phra Bat hill of Phu Phan Mountain. There are 62 archaeological and cultural sites offering prehistoric rock paintings from about 4,000 to 2,000 years ago. There are also many historical artifacts from Dvaravati and Khmer cultures. Within the historical park is also the site of a sputa constructed during the 1920s, and a Buddha’s footprint. Festivities for tourists are held each year in October in the park and its vicinity to celebrate Usabaros Day and Ban Chiang World Heritage Day.